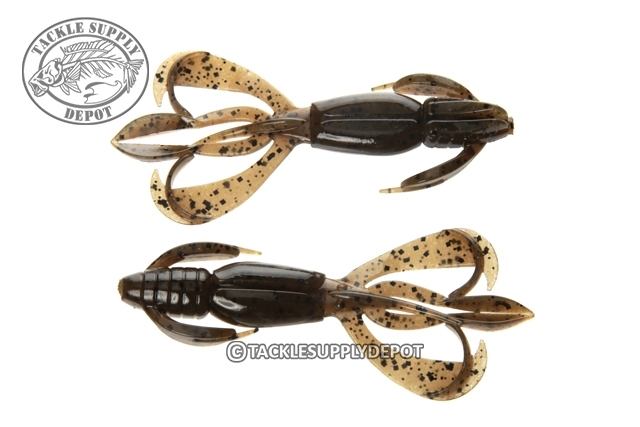 Keitech is proud to announce the release of their first craw-type bait called the Crazy Flapper. Designed for anything from dragging on the back of a jig to swimming on a Texas Rig to punching heavy cover the Crazy Flapper has the action and profile for grabbing theattention of the big ones. The Crazy Flapper Patented design is available in three sizes and an array great fish catching colors which have incredible action and durability making this one of the hottest creature craw baits on the market since their release. No expense was spared to deliver the perfect action with these products. The inner blister pack maintains the integrity of the baits making sure the Claws and Tentacles have a full flutter action each time one is taken out. Made out of a dual injected specific blend of PVC plastics to increase durability along with a bulky body which allows the angler to use less weight, slow down the fall and keep the bait in the strike zone longer. Featuring Keitech's well known Strong Squid Scent for added attraction (Excluding Sight Flash). The Crazy Flapper has been granted a US Design Patent (#D721416). This Patent recognizes the uniqueness and effectiveness of he Keitech design. Sometimes you need a different look and these fit that.